It’s well known that the sand making technology has direct effect on the quality of the sand aggregates in the construction sand making industry. 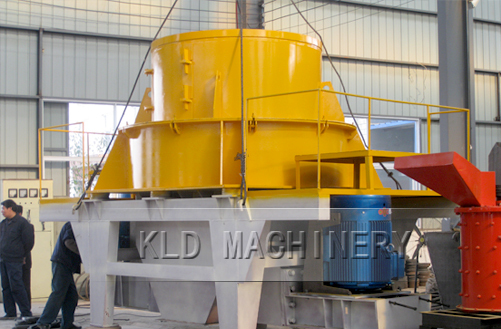 In order to further extend the service life of the sand makers and increase the ability level,KLD has invented the new generation of high efficient sand makers to make new contribution to the construction industry.In recent years, our company introduces advanced technology and forms a strong research and development team to handle all kinds of product problems. The new generation of sand maker adopting advanced international technique can not only provide the best quality gravel aggregates for the fields of highway, railway, high-rise building, municipal engineering, water and electricity construction and concrete batching plant, but also become the mainstream device applied in the industries of metallic ores crushing, silica sand production and slag handling. It’s famous for the features of simple structure, easy installation and maintenance, low cost and environmental friendliness. Compared with the traditional sand maker with the same power, the new one has bigger handling capacity, higher yield and more stable performance. It can produce all kinds of minerals such as pebbles, slag and tailings. And the artificial sand made by the new type of sand maker can completely replace the natural sand used in the large scale projects. Good quality sand makers will offer premium sand aggregates which meet the national standard for infrastructure construction and help increase the domestic construction quality.